(Berkeley, CA) 06/01/2018 — UC Berkeley is fortunate that it can point to so many cross culturally-uplifting and important projects, such as the one funded by Vlad and Sana Shmunis. Their support has made it possible for Berkeley students to learn archaeology at two ancient cities in Israel. More about the Shmunises—their passion for archaeology and their philanthropy—in a moment. But, first…a little about ancient Megiddo, and its historical significance. By far the most important ancient city in Israel, Megiddo has worn many hats over the past five thousand years. During the Bronze Age, the city hosted cosmopolitan Canaanite kings whose relationships extended to Egypt, Turkey, and Mesopotamia. One thousand years later, Israelite kings such as Solomon garrisoned the city with soldiers, noting its strategic military position. Later writers so revered the city that they believed it was where the apocalyptic events of Armegeddon would occur at the end of days. Thanks to Tel Aviv University archaeologist Israel Finkelstein, Megiddo’s ancient history is now well understood. Since 1994, Finkelstein and his international team have excavated the Bronze and Iron Age city. By far the most important discovery came in 2016 when two 3,500 year old burials were discovered. Staff member Melissa Cradic, who recently completed her doctorate at Berkeley, made the discovery with a team of Berkeley undergraduates participating in the Shmunis Scholars Program. Using state-of-the art digital methods, the team identified several individuals—likely members of Megiddo’s royal family—and their luxury items, including gold and silver jewelry, and ivory figurines. This evidence is now being used to explore ancient population genetics, migration, and environmental change. National Geographic recently featured this discovery (read the full story here). 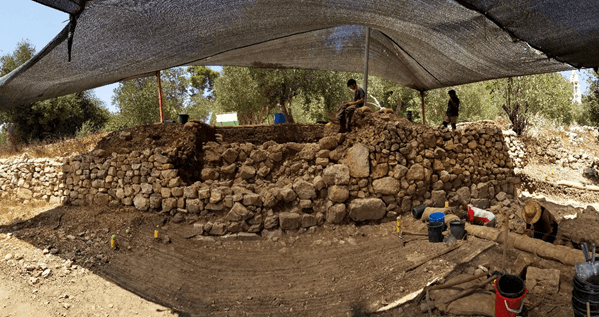 Finkelstein’s success at Megiddo inspired Vlad and Sana Shmunis to support his new project at Kiriath-Jearim , a small Iron Age settlement near Jerusalem. The Bible (1 Samuel 7:1) describes how the Israelites’ Ark of the Covenant was kept there for two decades before eventually finding a home in Jerusalem’s temple. Finkelstein’s excavations in 2017 confirmed that the settlement was used in the eighth century as well as later in the Roman Era. 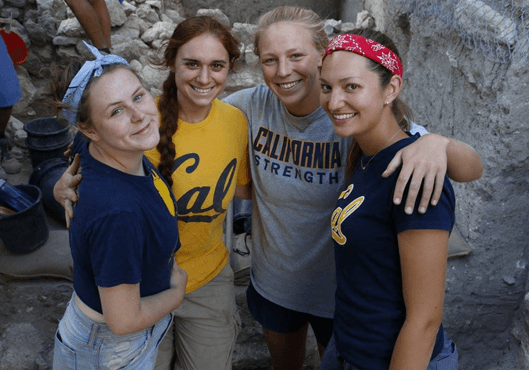 Now in its third year, The Shmunis Family Archaeology Scholars Fund has already supported six UC Berkeley undergraduates. Two more Cal students will travel to excavate at Megiddo this summer. Students not only learn how to conduct archaeological field research, but they also have opportunities to travel around Israel to learn about its ancient history and modern peoples. The Shmunis Family Archaeology Scholars Fund was established by husband and wife, Vlad and Sana Shmunis. A counterpoint to his role as CEO, Founder, and Chairman of RingCentral, a cloud-based communications company based in Belmont, California, Shmunis is an avid enthusiast of archaeology. Having spent time working at Megiddo with the Berkeley students, the tech-entrepreneur appreciates the value of investing in high-impact projects. “Ancient history, and, in particular, that of the Near East and Rome, has been a life long interest, inspired and supported from a very early age by my late father Gregory Shmunis. We’re delighted to have the opportunity to contribute to this important area of science,” said Vlad. “Doing so, while fostering tighter cooperation between two great universities — UC Berkeley and Tel Aviv University — and making a difference in the lives of several promising young scholars from Berkeley makes it triple-special for us,” added Sana Shmunis. So, what has this experience offered the eight UC Berkeley students selected to participate on this prestigious project? Karlene Shippelhoute, who graduated in 2016 from Cal with a B.A. in Ancient Near Eastern Civilizations was one of the original three students to visit Megiddo as a Shmunis Family Scholar. A former student of Benjamin Porter—Hearst Museum Director and an Associate Professor of Near Eastern Archaeology at Berkeley—she is now completing her first year of graduate school at Johns Hopkins University. For Shippelhoute, the benefits are multiple and profound. 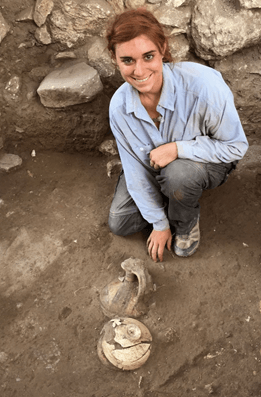 The scholarship helped the northern Californian student lay the groundwork for a career in archaeology. But beyond offering an opportunity to refine vital professional skills, the financial support is pivotal in helping future archaeologists develop the international rolodesk needed to move projects off of the drawing board and into the field. “The Shmunis Fellowship provided me an opportunity to receive rigorous training while broadening my professional network with renowned archeologists. The Megiddo program sparked my current research interests and equipped me with the skills necessary to succeed in my graduate program,” says Shippelhoute. Shippelhoute was one of the original three students to visit Megiddo as a Shmunis Family Archaeology Scholar. Shippelhoute reports, “When Vlad was visiting Megiddo and excavating for a day, he uncovered the top of the bichrome vessel in the picture! For other UC Berkeley students who have benefitted from the Shmunises’ philanthropy, such as Edlynn Andrus, the impact on their early-career outlook is as transformational as it is inspiring. Whatever special insights the Megiddo and Kiriath-Jearim projects reveal, the Shmunises’ continuing involvement is testament to the good things that can happen when expertise and enthusiasm are shaped by philanthropic passions. Thursdays, 11 a.m. to 8 p.m. Saturdays, 10 a.m, to 6 p.m.
We are anthropologists, educators and researchers, motivated by a passion for preserving stories today in order to make new connections tomorrow. Founded in 1901, the Phoebe A. Hearst Museum of Anthropology is dedicated to the study of cultures from yesterday and today, both near and far. Today, the Museum contains an estimated 3.8 million objects from California and around the world, as well as extensive documents, photographs and film recordings. In this capacity we continue a legacy of enrichment and education, functioning as a research unit for the University of California, Berkeley supporting scholarly discovery and community-based research. The Hearst Museum’s mission is to steward a vast collection of objects spanning the infinite breadth of human cultures for the advancement of knowledge and understanding. We promote the tools of humanists and social scientists, encouraging people to reflect on alternative perspectives, connect with others, and take action for positive change.